I have three sons, ranging in age from four to eleven. Reading aloud at bedtime has been a tradition since the oldest was born, so I'm always on the look out for books that will interest them while teaching good lessons and engaging their minds, too. (Among many others, we have under our belts Charlie and the Chocolate Factory, the entire Harry Potter series, the Chronicles of Narnia, The Hobbit, L. Frank Baum's original OZ series, A Christmas Carol, and we're currently making our way through Laura Ingalls Wilder's Little House books.) Consequently, I read quite a bit of juvenile lit and young adult fiction. But sometimes, among all these books directed at kids, I find exquisite stories that, while written for the younger set, entrance me as well. 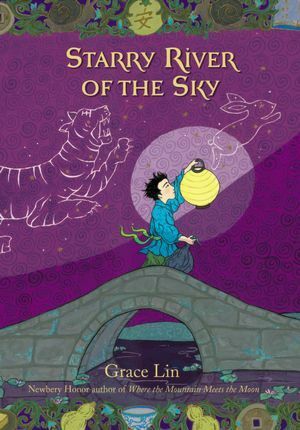 Starry River of the Sky and its predecessor, Where the Mountain Meets the Moon, both by Grace Lin, are some of those books. A young boy named Rendi has run away from home and ended up trapped in a tiny, remote village called Village of Clear Sky with no way of traveling on. Taken on as a chore boy by the village innkeeper, Rendi's negative attitude and seething anger sour his potential friendships, but he's noticed something odd. The moon is missing! He also seems to be the only one who hears dreadful moaning, groaning, and crying sounds all night long, which make it impossible to sleep, not helping his short temper at all. One day a beautiful, mysterious woman shows up to stay at the inn. She befriends Rendi and the innkeeper's daughter and starts both the village and Rendi on the path to healing from anger, selfishness, and pride. As Rendi tells his story, at the grand lady's gentle insistence, he recognizes the roots of his anger in his relationship with his father and learns that "sometimes the best decision is a painful one, but it is never one made out of anger." Perspective plays a large role in the story as the tale of how a mountain disappeared from the village's landscape is told from two different points of view, one at the beginning of the book and one at the end. Rendi's willingness to change and let go of his anger starts when he sees his reflection while in the middle of an angry tirade, and gains a new perspective on himself. "'I look like...I look like...' Rendi gasped, 'my father!' He felt as if a searing knife had been stabbed into him, the reflections in the water revealing a likeness he almost could not bear. For a moment, he was blinded by a mix of memories, pain, and regret." Ms. Lin takes inspiration from the folk tales of her Chinese heritage, telling several distinct but linked stories-within-the-story, each set off from the main text by a colorful header and different font. Each chapter includes gorgeous, full-color illustrations, that match the evocative prose perfectly. She taps into a powerful tradition of storytelling that entertains while communicating important lessons. Check it out from your local library (find the nearest one here).